I don’t usually like to take a negative tack when approaching previews for games. It’s typically understood that these titles are in early stages, often pre-alpha, not to mention only being a small slice of the full experience. Previews are more to get a sense of the gameplay, not judge the final release. Sometimes though, a preview goes badly, and I feel the need to mention the problems, if for nothing more than to assist the developers with identifying flaws before release and fixing them. 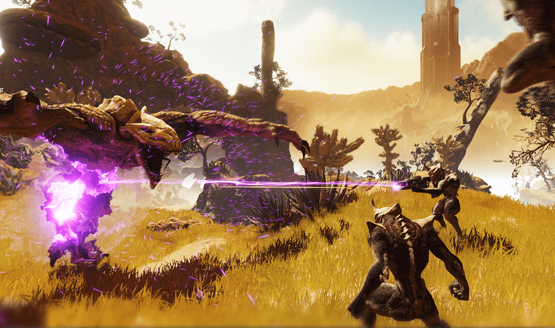 Seeking Dawn is an ambitious VR RPG shooter that looks something like Farpoint on steroids. Alien worlds and crazy bugs are just the tip of the iceberg. The worlds are bigger, there are different gear loadouts to use, and various items to pick up. There’s also cooking, crafting, survival elements that will need to be addressed in addition to some kind of construction mechanic. On top of all that it can be fully played in co-op. I told you it was ambitious. Visually it looks fantastic. I was thoroughly impressed, although I was playing on a Vive for my demo. In fact, Seeking Dawn is in primary development for Vive and Oculus, but in chatting with the developer while waiting for my go, it was mentioned that they were working to bring it to PSVR, as well as Aim support. Many of the weapons in the game are designed for dual wielding though, and Seeking Dawn is a full locomotion. Obviously, Sony doesn’t have any Move controllers that support this kind of gameplay. Yet. When I began to ask how they were planning to solve that problem — if they were just going to rely on the DualShock or convert everything to Aim — they mentioned trying to support an “upcoming peripheral” and then quickly became quiet when I pressed for more information. It’s entirely possible I misread the responses to my questions, but it seems like Sony is actively working on a solution for dual motion controllers with analog sticks, which is about the most information I got from this demo. When it was my turn to get the headset on, the demonstration didn’t last long. I was able to walk briefly around, trying to get my bearings and awkwardly running into doorways and my co-op partner, who’s avatar was a stiff looking character model holding a rifle that he didn’t actually have equipped. I didn’t even have a chance to get to the combat portion of the demonstration before the screen went black. For a moment I thought it was loading, but it turned out the Vive had somehow shut off and the demo had to be restarted, meaning I couldn’t play in co-op. Time was already running short, so I had to head to my next appointment. My short-lived demo ended after a minute or two of awkward ambulatory gameplay that didn’t really explore what Seeking Dawn could be. Seeking Dawn has the opportunity to offer something really special if they follow through on some of the promises, but the E3 presentation didn’t seem ready for the limelight quite yet. Even beyond the Vive issue I had, watching the other players going through the demo highlighted a number of problems and design oddities that ought to be addressed before its next public showing. Seeking Dawn needs a little more polish to clean up something that is quite rough around the edges, but there’s certainly a hidden gem somewhere in here that just needs to be excavated. Seeking Dawn currently does not have a release date, coming to PSVR, Vive, and Oculus. Check out all of our E3 2017 coverage.